Common theme, no twist, old revenge based pattern, typical villains, a body without muscle & Jugnu (Salman) was blindly unfit for action, result flop.Jugnu couldn’t fly like firefly. “Jugnu” (Firefly) sparkles in the night & deletes darkness but the“Jugnu” of Jaagruti couldn’t seem sparkle the movie because of his flop action, silly story & carefree boy image. "Lucky- No time for love"
Luck is luckily fallen down, a big downfall on box office. Salman is often like a mad boy for love. Childish story. Core team of this movie is like a chiller party. An old man with a young Russian school girl-no chemistry matched, totally chemical lochha in Russia. Xerox never looks like original; Almighty (Audience) is watching every pirate of Cinema Caribbean. Watch “Bruce Almighty” instead. Who is God here? If Amitabh, then what about Bhootnath? Confused Salmaan, loosely scripted & directed movie. Subhash Ghai directed it in over confidence like “Bhanumati’s Kunba”. Salmaan & Zayed behaved more Autism than Anil Kapoor while Cat Kaif like plastic doll. 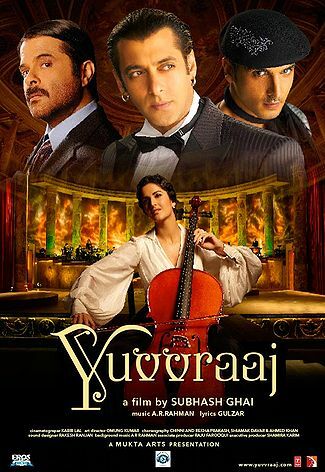 Three Yuvvraaj couldn’t make it hit. A. R. Rehman won the heart of audience by music but rest of core team of movie was like jokers of Circus. 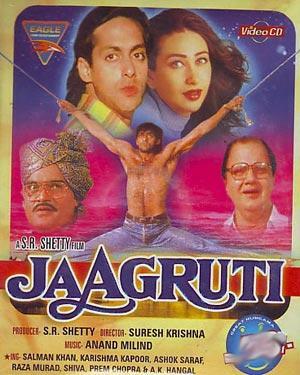 Flop writer, flop Jaggu dada, childish actor Sohail, fatty Zarine, all of put this movie into a grave. Well, other components were quite so-so. Not performed according to name, so at box office “sabka baj gaya game”. Watching ghost in Hello Brother, audience says khisko brother. Vulgar dialogue & acting got unsuccessful at box office. Arbaz as often without face expression, lol.....brotherhood. Romance between Fairy & innocent children put the movie on impossible mission.Beauty with Langgur- Unbelievable matching. Shreedevi was really a Chand Ka Tukda but Anupam Kher was a full moon. The whole movie based on stubborn of marriage, so couldn’t hold the audience. Cat-Rat matching, so less watching. All were alike scoop whoop dramatic movies. कौन है नासूर,कौन है नम्र-निराला ? किसने सुमिरन किया,किसने मुख न खोला ? कौन है सत्य-साईं,कौन है झूठ बोला ? किसने पुन्य किया,किसने पाप है पाला ? कौन है दाता दानी,कौन है लुटाने वाला ? किसने ईमानदारी निभाई,किसने बेईमानी में हाथ डाला ? कौन है अधम पाखंडी,कौन है धर्म वाला ? किसने माता-पिता को सम्भाला,किसने घर से निकाला ? कौन है बेकसूर,कौन है गुनाहगार साला ? किसने अमृत पिया,किसने विष का प्याला ? कौन है खुनी,कौन है रक्तदान करने वाला ? किसने मालामाल किया,किसने निकाला दिवाला ? कौन है अमीरचंद की औलाद,कौन है फकीरचंद का पाला ? किसने दीन-दुखियों को अपनाया,किसने है टाला ? कौन है पेट फुलाकर सोया, किसने भूखे पेट वक्त निकाला ? किसने मोहमाया अपनाई,किसने सर्वस्व त्याग डाला ? कौन कहलाया अबला,कौन कहलाया सबला ? किसने बरसाए फूल,किसने चलाया भीषण भाला ? कौन है बहरूपिया,कौन है सच्ची शक्ल वाला ? किसने की 420-सी, किसने पहना 786 का बिल्ला ? कौन है मासूमों का सौदागर,कौन है रखवाला ? "कातिल जवानी और भड़कते अरमान"